ABC/Image Group LAEven though Dierks Bentley has lived in Nashville for a quarter-century and has his own Music City honky tonk, Whiskey Row, part of his heart still remains in his native Arizona. That’s why he’s proud to shine a spotlight on the West with his latest album, The Mountain, which was written and recorded in Telluride, Colorado. “I’ve got a foot in Nashville and I definitely have more of a foot than ever out West where I’m from,” Dierks explains. “You know, I’ve been here 25 years and I love Nashville, and I love seeing all the changes happening,” he says of Music City’s exponential growth. “You know, there was times that I probably would’ve worried about saying that, because you’re trying to make it,” he admits. Once he’s realized all his country music dreams, Dierks reveals he plans to head back home to Arizona. 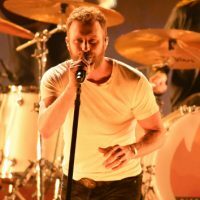 Dierks’ latest single from The Mountain, “Burning Man” with Brothers Osborne, is currently in country’s top five. Next Thursday, he kicks off the Burning Man Tour in Hamilton, Ontario with Jon Pardi and newcomer Tenille Townes.